This was an experience like never before. I have hiked along the Olympic peninsula, Little Si and RattleSnake ridge. This compares to none. I would consider myself a novice on this hike which seemed slightly higher in difficulty level than moderate. But in all it was the most interesting and rewarding hike. This time it was not just the two of us, me and Tarun. We had three more friends and that added to the fun. We started from Bellevue at around 7:45 am. I had packed in stuff in my and tarun's bag based on last hike's experience. More water, already prepared sandwiches, some hand sanitizer and tissue papers. We had our new hiking shoes on. We started off in what didn't seem like a nice weather. A few miles down and it started drizzling. Well that didn't look very inviting and everyone was blaming Tarun for that... I don't know why. After some time (at 8:14:53) :) we stopped for a sad breakfast at Burger King, though Srijan's banana bread was awesome. After breakfast we headed out again and as we crossed the Snoqualmie area, we saw loads of snow and it was pouring on us. There was no sign of the sun until we were close to Yakima, where a beautiful weather greeted us. Tarun knew an alternative route to Yakima which went through the Yakima canyon along the Yakima river. Only one word can describe our journey through that, breathtaking. The river was embellished with eddies and small boulders. The mountains together looked to me a like a sheet of green silk where the sunlight was giving it a new texture. Well that's as much geography knowledge I have that I am not sure if you would call those mountains or peaks. I'll keep mountains. However give any word, they stood together to form a majestic skyline. I was so much in awe of the view that I didn't realize that none of us knew where we were headed to. Me and Tarun had both forgotten to take the directions :) (is it a usual thing? ...oh well!). We had the WA state map and following that we landed into what seemed like downtown Yakima. We stopped by Red Lion Hotel for some information. At the lobby we found a computer with internet and a printer. This was all we wanted. 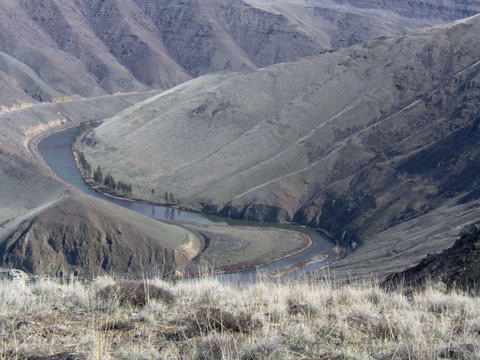 We took the print outs and headed back to the same place where we came from, the Yakima canyon. So we would be hiking in that picturesque terrain. The trail guide had mentioned that it would be difficult to find the trailhead and so it was but not very much. After asking a few people on the way and driving on to a fun filled bumpy ride on stones and boulders we reached the trailhead. Oh and how could I forget the confusion that everyone had about which was the actual trailhead. 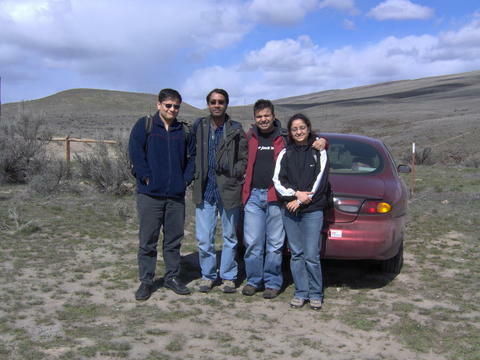 Srijan asked Tarun to go beyond the area which looked like a parking place. Rest of us had different opinions. Agreeing to Srijan we went ahead and that certainly was not good for the health of our city car. 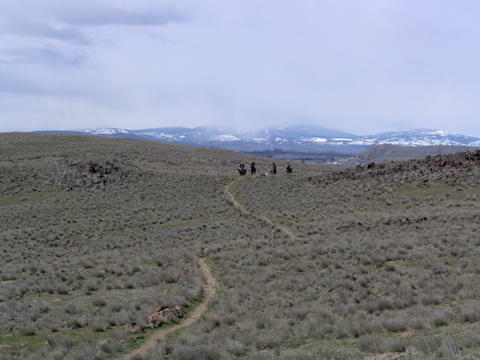 Road was extremely rocky and we decided that we will take the trailhead that we had seen before. So came back and parked the car over there. We started off carrying our bags and clicking some pictures. The trailguide mentioned that you would see signs at the trailhead but what we saw was a metal plate with loads bullet shots in it. It was difficult to read it, nevertheless we started walking up the mountain. Tarun said that we would meet a couple of false peaks before we see the actual peak so I knew that this seemingly easy hike to the top of the first mountain was not all that was there. Well, at least for me this hike was not one of those easy ones. The elevation gain was higher than I have ever experienced before. The trail has small rocks and boulders and then my new shoes. I didn't know until after I had finished the hike that you have to wear them for some time before an actual hike. My new shoes were biting my feet and I ended up with blisters. And later I realized that so did Tarun. This last one was, but only among those bunch of peaks. There was yet another higher peak somewhat distant that looked inviting. We all sat down for some time and had lunch. As we reached up here in about 1.5 hours, we all decided we could go for that higher peak. 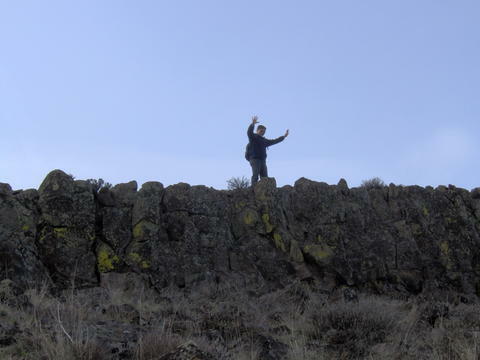 So we set off again in quest of the highest point in Yakima Skyline Trail. This lap was probably the hardest and most adventurous for me at least. Our leader only made it harder by not taking up the trails but cutting across mountains. 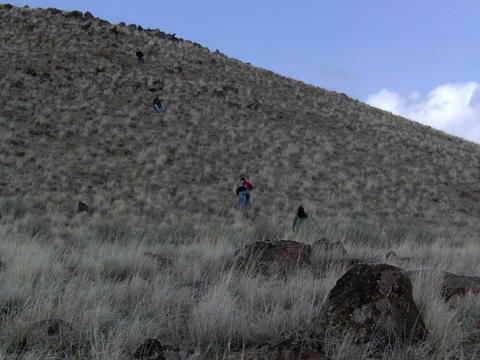 We even had to walk through a near vertical ( okay this is exaggeration but probably at an angle of 30-40 degrees) mountain negotiating with heavy wind. But the hiking shoes worked wonders. They gave me the confidence that I can do it and at least I was not scared :). Amol had come back to make sure we make it through safely and Tarun was already watching me and Eera cross through. Then finally we reached the bottom of that highest peak. This was another gem of a hill, very steep and very rocky. But we climbed that up as well and wow we were on what seemed like one of the highest peak. 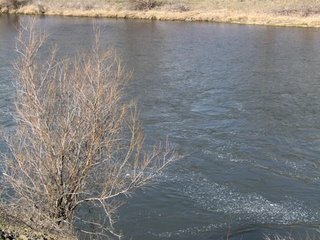 There were a few other just across the rivers that looked somewhat of the same height or a bit higher. We sat there for a while enjoying the cold wind and the aura of the Yakima canyon. Then we headed back but climbing down the peak again through those rocks was another challenge, but that makes it more fun. Other than this the hike back was very uneventful and full of longing for the car which was way down somewhere. But we did see some arrows made of stones on the way back. We had mixed reactions on this one. Best one was of Amol though. He said what if this arrow is leading us to a deadly maniac who is ready to kill us. Well, no one believed him :) and we followed the arrow. But the next one was actually leading us the wrong way so we decided to head into the direction we thought our car was. And then after some treading along the path we reached our car. Phew ... it was a memorable hike I must say. Makes me look forward to the Grand Canyon Hike. This hike in the Olympic peninsula is listed as one of the great 100 hikes in Washington, 9.3 miles of Olympic wilderness. It takes about 5 hours drive from Seattle to the Cape. Adding 6 hours suggested hike time and 5 hours return journey to that made us feel that we need to start at 4 AM. And as it always happens, we left home at only 7:30 AM packed with grub for the way, some music, the map and our cameras. The weather was spectacular, bright sun and little chill. We hit the road, eating bananas and cheese curls and listening to NPR and 'Bunty aur Babli' alternatingly. The road was familiar to us from our last trip to the Olympic peninsula in 2005 and next in turn was the Edmonds-Kingston Ferry. We queued up for the ferry about 30 minutes before its departure and that was the ideal time for us to catch up a coffee and some croissants that we had picked up on the way. 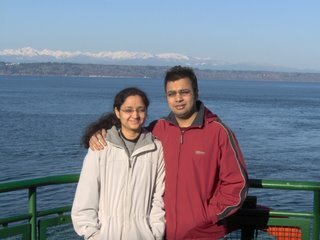 We were enjoying our coffee and mini breakfast at the "Waterfront Coffee House", when Tarun asked us to leave for the car. We came outside only to realize that he was very close and lines had started moving and we ran for the car. I was clumsy keeping my coffee while trying to make it to the car as soon as I could. We got down from the ferry and continued on 104 West and then 101 West to Cape Alava. This time along with music and food it was Tarun's inexplicable (can't say it is good :)) humor keeping both of us entertained. These highways are not typical straight roads but have a lot of twists and turns and they don't really suit me very well. I started feeling dizzy so I decided to doze off. 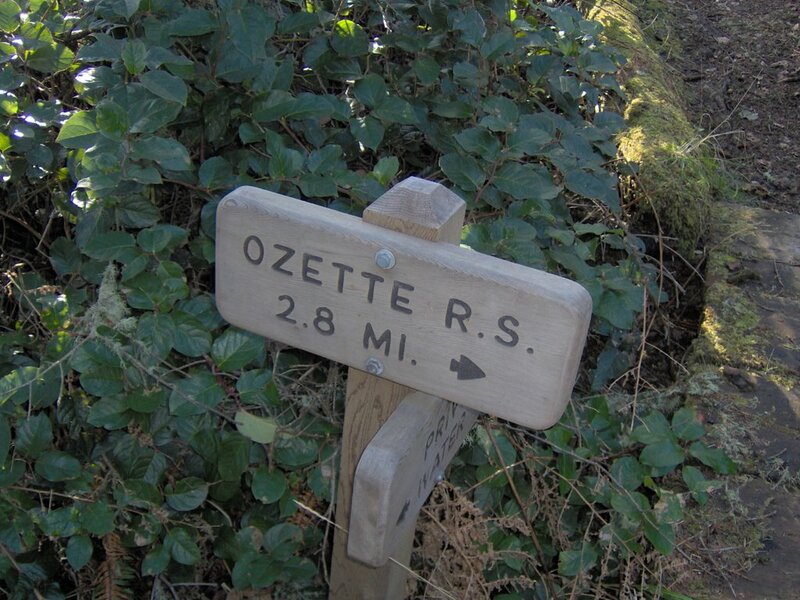 When I opened my eyes were at the Lake Ozette Ranger Station, our destination. We packed the bag that tarun would carry with food and set off for way. Well, I just carried myself. :) We took the Cape Alava trail first. It was 1:20 and we decided that we would be fast in order to finish the hike in less than 6 hours. 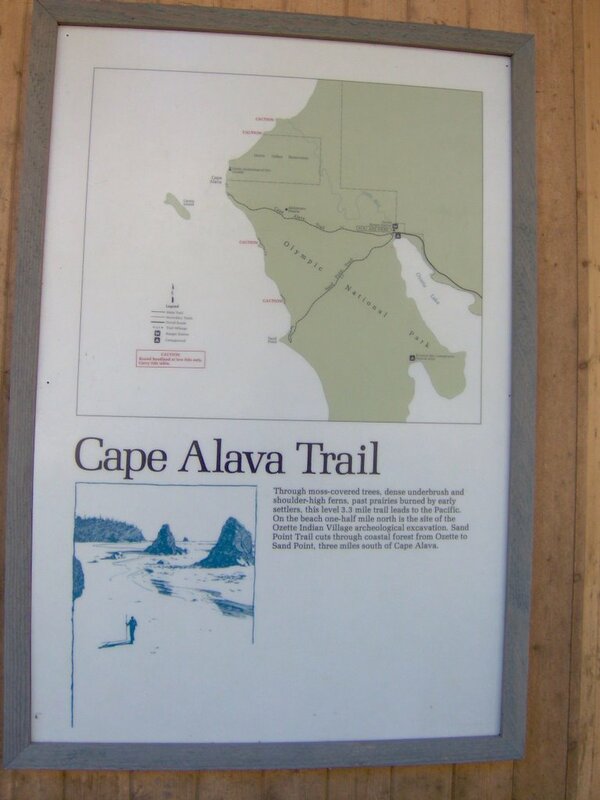 The Cape Alava trail is an easy hike of 3.3 miles. 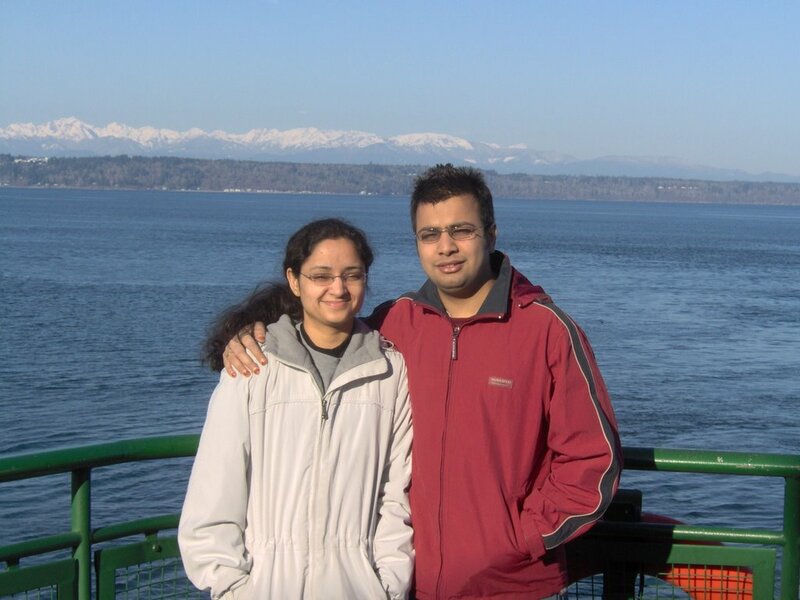 I was always on my toes to catch up Tarun, but I was more cautious in order to not slip along the way. All along the way Tarun would keep telling me we need a walky talky and my reply would be NO :). 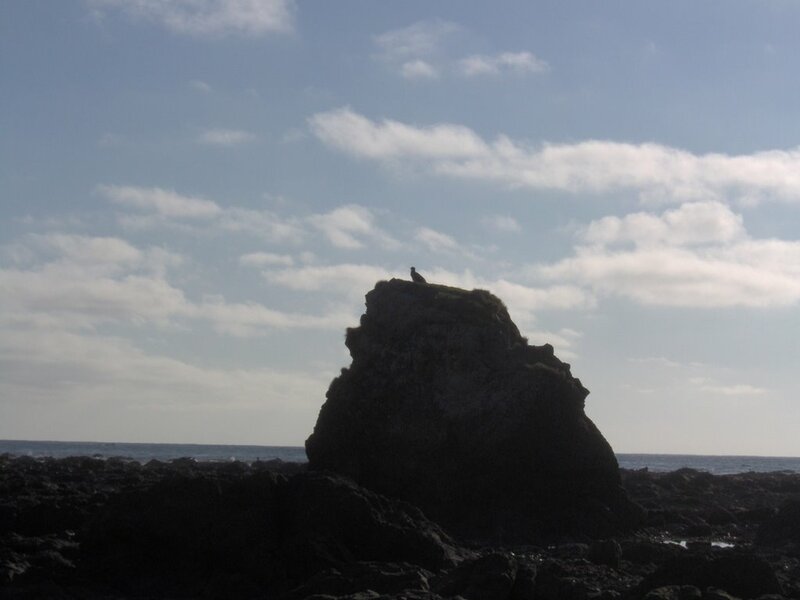 Pretty soon, we started hearing the sound of the ocean and before an hour was up we were there at the Olympic peninsula. We sat down for a little sandwich but what bothered me was making that little sandwich over there as we sat on small wobbling piece of wood. But we enjoyed the sandwich while watching the melting gold of sunlight in the ocean and the humbling vastness of the Pacific. Another lesson: Make the sandwiches at home, it reduces the payload as well. We need to finish the hike and so we need to rush, thinking this we head out for our next trail, Cape Alava to Sandpoint trailway. This was the most fun of all. Seaweeds, unstable sand and gravel, rocks and fallen trees blocking the trailway. We had to negotiate through them all. Most interesting of all was that we were not sure how far and where the destination, Sandpoint trail, was. Someone we met on the way said its still 2 miles further. We set off on our way and somehow walking on the gravel and sand was the most difficult even more than that on the rocks. Tarun had seemed to create a funny name for me and he kept calling me from that name and he even wrote it on the sand. :) That was cute. We met two more people on the way who told that Sandpoint is 0.9 miles from there right by a tapering rock which we could see from there. We looked at our watches and we were right on track for beating the 6 hours time. We walked faster and those two gentlemen were left behind. We came to the tapering rock but we could see no trail. 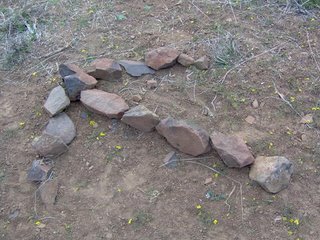 So we decided to walk aroud that rock. That meant again negotiating through the rocks. We saw bald eagles but no trail. All the area was surrounded by huge logs of wood. 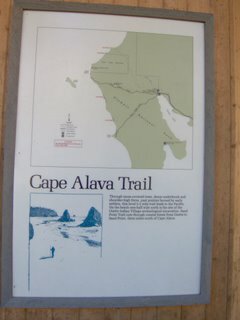 Tarun told me that we should follow the footsteps and they led us to a sign which was haunting us from the end of Cape Alava trail. 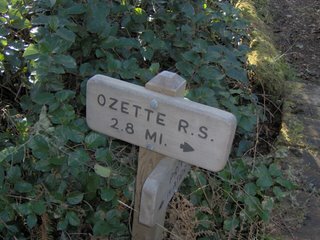 We went up to that and thankfully we saw signs to Ozette Ranger Station, ahead 2.8 miles and we were still tracking good time. We head back on that trail and Tarun was faster than before. I was somewhat tired and was not getting a good grip on the trail. Result: I slipped 3-4 times while Tarun was still trying to cheer me up calling me my funny name. But we made to the Ranger Station holding onto our sticks that we had picked up on the way in about 4 hours and a few minutes. It was the longest we have ever hiked, captured some of the most amazing views in our eyes and our cameras and stuck off one hike from our goal list of hikes.